The latest Chambliss Astronomy Achievement Student Awards poster competition, which occurred in June during the 228th AAS meeting in San Diego, California, was quite exciting and informative! There were 19 students entered in the competition, of which nearly half were undergraduates, and there were approximately 20 judges. Student posters were evaluated during the morning coffee breaks and afternoon poster sessions Monday through Wednesday of the meeting. Though students were only required to be at their posters during these above evaluation periods on the day their posters were featured during the meeting, I heard from students and judges alike that having all posters up throughout the meeting period was a treat! Judges additionally expressed, as usual, that being a Chambliss judge, and talking with students about their work, was a very rewarding and gratifying experience, which not only allowed them to interact with students but also allowed them to focus on some science for which they might not have otherwise had the time. So, if you haven't signed up to judge student posters in the past or in a while, I encourage you to do so in the future — the more judges we have, the fewer posters each judge is responsible for judging! Your next opportunity will be at the 229th AAS meeting in Grapevine, Texas, in January 2017. Congratulations, all! 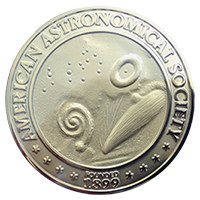 On behalf of our Society and all of the students who entered the AAS 228 Chambliss competition, I would like to thank our volunteer judges, with a special thanks to those who volunteered onsite to replace judges who had last-minute schedule changes. I would also like to thank the AAS Executive Office staff who help to make this very important competition such a big success.